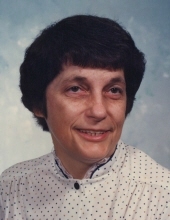 Madison-Rosemary M. Ford; the wife of the late Buddy Ford; mom to Dianna (Jim), and Ruth; grandma to Gary (Amanda), Nick (Shannon), and David (Jordon); Grammie Rosemary to Jackson, Alaina, Lakota, and Dawson; passed away peacefully with her daughters by her side on Sunday April 7, 2019. She also leaves her son-in-law, Gary Bridge; her best friend, Sharon Dapson; and our devoted cousin, Bill Snow. Rosemary’s family send heartfelt thanks to the entire staff of the Waterville Residential Care Center, and especially the second shift staff, for their care and compassion given to Rosemary. In loving memory of Rosemary, kindly consider a donation to Hospice and Palliative Care, Inc., 4277 Middle Settlement Road, New Hartford, New York 13413. To send flowers or a remembrance gift to the family of Rosemary M. Ford, please visit our Tribute Store. "Email Address" would like to share the life celebration of Rosemary M. Ford. Click on the "link" to go to share a favorite memory or leave a condolence message for the family.